A number of new combination approaches have gained approval in the past year for the treatment of patients with BRAF-mutant metastatic melanoma, expanding the number of effective treatment options that can improve quality and length of life for many patients. Concomitant inhibition of both BRAF and MEK kinases with targeted inhibitors has become, “The recommend approach for molecularly targeted therapy,” according to Keith T. Flaherty, MD, with Massachusetts General Hospital Cancer Center, in Boston, Massachusetts. A. 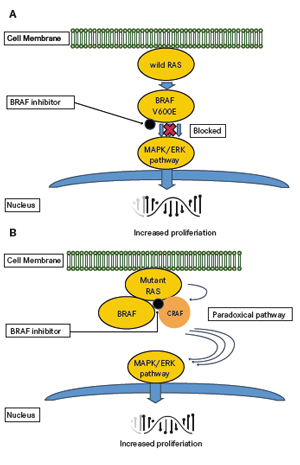 When BRAF kinase is constitutively activated due to a mutation (eg, V600E), treatment with BRAF inhibitors results in blockade of downstream MAPK pathway. B. In cells with wild-type BRAF, treatment with BRAF inhibitors results in transactivation of CRAF and promotion of RAF dimerization, causing paradoxical activation of downstream MAPK pathway in the presence of upstream oncogenic changes, such as RAS mutations. Based on data from two phase III studies demonstrating overall survival (OS) prolongation, the dabrafenib/trametinib combination regimen received full FDA approval for the treatment of patients with unresectable or metastatic BRAF-mutated melanoma in November 2015. The most recent analysis from the COMBI-v study presented at the 2015 European Cancer Congress (ECC) reported a 7.6-month prolongation of OS with dabrafenib and trametinib compared with single-agent vemurafenib (25.6 vs 18.0 months; HR, 0.66; 95% CI, 0.53-0.81; P <.001).4 The estimated 2-year OS rate was 51% with dabrafenib and trametinib compared with 38% with vemurafenib monotherapy.